SOLD OUT - Shop the Marlin collection for our other automatic movement watches. Shop Timex X Peanuts for other Timex watch styles featuring the Peanuts gang. Our iconic 1960s Marlin® case gets an aesthetic refresh. Ticking inside is a tried and true 21 jewel automatic movement, creating a contemporary timepiece that honors our watchmaking history. 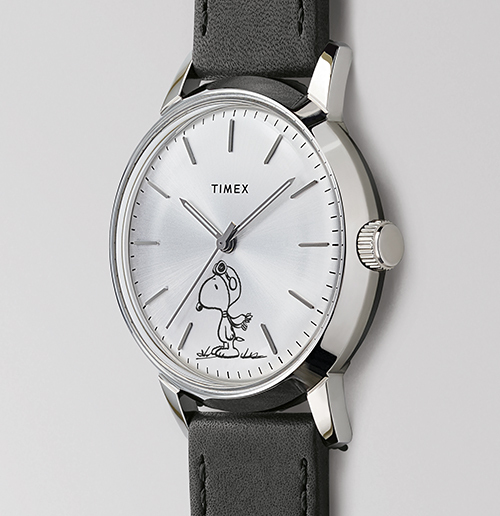 The sleek monochromatic Marlin® is given a playful update with Snoopy as Flying Ace featured on the dial. First in the papers in 1965, Flying Ace made his appearance at the height of our original Marlin’s popularity. Now we brought the icons back together in space and time. Our special edition Snoopy Marlin Automatic is wound automatically as a result of the wearer — your watch moves because you do.